Rebecca Watson Fired From SGU Podcast? Thank you so much for your feedback. We’ll be honest, this isn’t the first time we’ve heard about Rebecca being too fake. We take this very seriously and have now decided to fire her from the show. 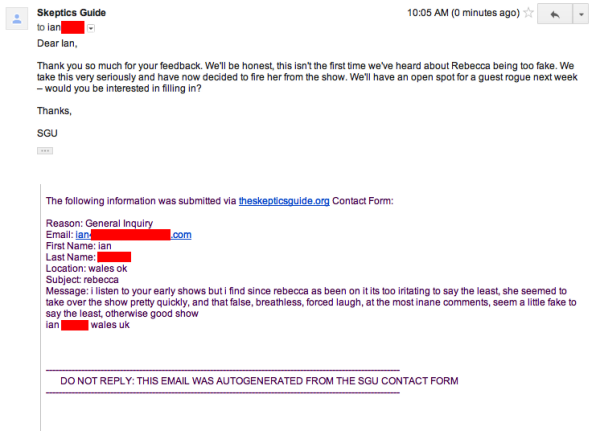 6 Responses to Rebecca Watson Fired From SGU Podcast? Pretty sure this was a joke post from SGU. Thanks for your comment, Sarah! Is there any documentation which supports that theory? Keep reading SkepDirt! I thought this was a pretty obvious joke from SGU. Surely you’re not taking it seriously, SD? Thanks for commenting, Timid Atheist! This reporter firmly agrees that there are people who just don’t get sarcasm. Oddly enough, many of them understand sarcasm when it comes from people they are fond of, but then take anything said against those same people with the utmost seriousness.